It comes with collapsible base 4 Traveler - This amazing portable display stand is made from strong and light aluminum tubing. Unique base folds to allow compact shipping. Telescoping feature allow you to use various size banners. 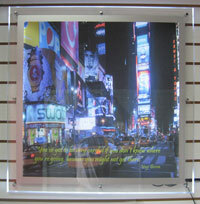 The versatility of this display will also allow you to display either one or two banners. System I display stands are easy to assemble and offer adjustable height for added versatility. Use these display stands at tradeshows and retail locations when you need a banner with one or two-sided visibility. C$149.00+taxes for single sided, C$179.00+taxes for double sided. AA Printing, design, manufacture and distribute all needed exhibit products. The Bannars Stands we sell come with life time warranty. Please contact us for all of your exhibit needs: from brochure holdesr to comprehensive solutions to exhibit shows. CLEARANCE The most rigid among all banners stands. 2 sides. Like SYSTEM I it comes with life time warranty. It is expandable and adjustable. Metal dowels included. WAS: 139.00+taxes. NEW! NEW! 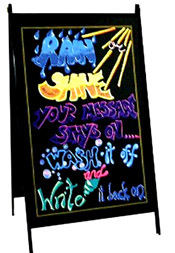 MARKING BOARD KIT 24"x36"
Economical write-on/wipe off marker boards, double sided on .040 high impact plastic. Faint grid lines assist in uniformed marking, for indoor use only. Available in black, white and yellow. Use as a shelf talker, price tags, product labels, product indicators, price point cards and many more uses. For custom sizes, available in black, white or yellow colours or quanities please refer to our Request Info page and send us your information so that we can get you a quote. Aluminum double-side or single sided retractable roll up stand. Strong and sturdy construction with heavy duty molded end plates. Snap aluminum top frame holds the graphic securly. It comes with a durable carrying bag. This is a rollup stand is not adjustable.